Calapan, officially the City of Calapan, (Tagalog: Lungsod ng Calapan), or referred simply as Calapan City is a 3rd class city and the capital of the province of Oriental Mindoro, Philippines. According to the 2015 census, it has a population of 133,893 people. The city serves as the gateway to the Oriental Mindoro province with the implementation of the Strong Republic Nautical Highway (SRNH) an integrated ferry project of then President Gloria Macapagal Arroyo that extends further to the southern part of the Philippines. The Calapan City Seaport is the largest and busiest seaport on Mindoro Island, which is just 45 minutes away by ferry boats and roll-on/roll-off (RORO) ships to-and-fro Batangas City International Seaport. Calapan is currently one of the only two cities in Region 4-B (Mimaropa Region) the other being Puerto Princesa City in Palawan. Calapan serves as the region's administrative center. It is also the center of commerce, industry, transport, communication, religious activities and education in the entire province of Oriental Mindoro. Calapan is bounded to the north and north-east by the Calapan Bay, south and southeast by Naujan, and to the west by the Baco. The city lies at the quadrangle bounded by 13°12.6 and 13°27’ north latitudes and 121°17’ east longitudes. It is approximately 28 nautical miles (52 km; 32 mi) from the nearest point of Batangas, 45 kilometres (28 mi) south of Batangas City and 130 kilometres (81 mi) south of Manila. The city has an area of 250.06 km2 (96.55 sq mi) and is composed of 62 barangays of which 22 are classified as urban and 40, rural. The city also has jurisdiction over the Baco Islands and the two Silonay Islets on Calapan Bay. The overall land characteristic is a wide plain with rivers, interspersed with wetlands at the seacoast periphery. The highest elevation is 187 m (614 ft) above sea level at Bulusan Hill, a 6-kilometre (3.7 mi) long landform east of the city, which interrupts the mostly flat terrain north-east of the Halcon-Baco Mountain Range. The City of Calapan is politically subdivided into 62 barangays. Calapan's climate is described as mild. It is relatively dry from November to April and wet during the rest of the year. February and March have the least rainfall while October and November are the months of greatest rainfall. Average yearly rainfall is 2,500 to 4,500 millimetres (98 to 177 in) at the City’s south-west portion. The average daily temperature is 22.9 to 28.3 °C (73.2 to 82.9 °F). Wind direction throughout the year is variable; Northeast monsoons prevail from August, November, December and January to March; East to Northeast on April; Southeast to South on May and June; Northeast to South on July and September, and Easterly on October. Climate is favorable for vegetation throughout the year under the Type III climate type of the Philippine weather bureau, PAGASA, with relative humidity at 81%. Calapan was formerly a small village before the establishment of the first Religious District in Baco. The District convent was transferred to Calapan in 1733 and began its jurisdiction over the Northern Mindoro Ecclesiastical Area. In the early 18th century, the town only occupied a strip of land stretching from Ibaba to Ilaya in a cross-shape facing the present church and cut off by the river. Later on, succeeding barrios were founded. In 1837, the capital of the province was moved from Puerto Galera to Calapan. When Mindoro became a part of Marinduque on June 13, 1902, the provincial capital was once again moved to Puerto Galera. On November 10, 1902, Mindoro was detached from Marinduque. In 1903, Calapan once again became the provincial capital. When Mindoro was detached from Marinduque on November 10, 1902, Baco, Puerto Galera and San Teodoro were annexed to Calapan in 1905 under Act. 1280, adding a total area of 843 square kilometres (325 sq mi). of land. In 1902, under Act 2824, the three municipalities gained their independence. In 1919, the boundary dispute between Calapan and Naujan was adjudicated by Presidentes (Mayors) Agustin Quijano of Calapan and Agustin Garong of Naujan over a portion of the territory of what is now known as the present boundary. The portion of agricultural area was awarded to Naujan, thus, making the area of Calapan much smaller as compared to that of Naujan which is now considered as the biggest municipality of the province. In the year 1998, Calapan was converted from a municipality into a component city by virtue of Republic Act No. 8475. The law was authored in Congress by Rep. Renato V. Leviste and was signed by President Fidel Ramos on February 2, 1998. On March 21, 1998, the people of Calapan ratified the creation of the City of Calapan in a plebiscite marking the same day as the city’s foundation day. Incumbent Mayor Arnan C. Panaligan became the last Municipal Mayor and the first City Mayor of Calapan. To date, it is the first and only city in the whole island of Mindoro. Since attaining cityhood, Calapan has witnessed significant improvements in commerce and industry, infrastructure and social services. New commercial establishments were opened providing employment and income opportunities for the residents An expanded program on social services delivery, particularly in health care and education, were undertaken. The city’s physical infrastructure was upgraded, which includes the construction of new roads and drainage facilities, as well as a new City Government Center. Tourism was boosted with the opening of inland resorts and new hotels. Malls had also started rising in the city to cater more to the shopping needs of its people. Sports and events tourism were also strengthened as was seen with the large influx of tourists in the city during the MIMAROPARAA, ALCULYMPICS and Ms. Earth Long Gown Competition all in 2011, proofs that indeed the city is capable of handling regional and national activities. Calapan boasts of many notable accolades and recognitions that it had garnered under its belt over the past years ever since becoming a city all of which serve as proofs of the city's continuing efforts to improve its standing and cement its reputation as one of the most livable cities in the country. Calapan was reclassified from a 4th class city in 2007 to a 2nd class city in 2010, on account of its innovations in public service, modernization programs, increased revenue collection, and overall economic improvement. The derivation of the name of Calapan cannot be traced with certainty. Some opined that it came from the word “Kalap” which means to gather logs. Thus “Kalapan” was supposed to be a place where logs were gathered. In the old records, however, there was never a mention of Calapan as a place where logs were produced or exported. Furthermore, huge forest trees where logs were produced certainly did not grow near the town, which was swampy. Another theory holds that Calapan was originally pronounced as “Kalapang” which, according to an old Tagalog dictionary, was a synonym for “sanga” or branch. It could then refer to the settlement of Kalapang as a branch of its mother town of Baco, an adjoining town. The name was later hispanized as Calapan. Vast ricefields such as this one in Barangay Bayanan II is a common scenery in Calapan. The city's economy is dependent on agriculture and fishing. However, a growing industry in machinery and tourism has contributed well to the city's annual income making it one of the fastest growing new cities in the country for the last 10 years. Since 1998, the city has experienced rapid development. The establishment of a special development area, particularly an eco-zone for light industries located at the Urban Development Area (Lumangbayan and Guinobatan), has been promoted and now serves as growth area which generates employment and spurs economic opportunities. Such industries focus on agro-industrial based activities such as food processing, handicraft making, furniture making and other related activities. Calapan plays a major role in the Philippine economy as one of the major food suppliers in the country. The city is also a major exporter of rice supplying to Metro Manila and major parts of Luzon making it both an agriculturally-progressive and urbanized city. The five major crops are rice, citrus, banana, rambutan and lanzones. The top five industries in Calapan are trading, tourism, services, marine and aquatic, and food processing. Calapan serves as the province’s industrial hub. It plays a pivotal role in the economic development of the province and its adjacent areas. Trading and commercial activities are mainly confined in wholesale and retail trade. Other thriving industries are manufacturing, financing, tourism, food and beverages and services. In recent years, the city has witnessed the influx of private investments that increase income and employment opportunities. The City Investment Code encourages new and existing entrepreneurs to increase their investments. All business establishments are also required to employ bonafide residents of the city to at least 70% of the job opportunities that they will generate. Majority of the vast agricultural lands of Calapan is devoted to rice production. Other crops grown in the area are citrus fruits such as calamansi, banana, lanzones, rambutan, mango, coconut and vegetables. Port of Calapan is the primary seaport serving the city which connected through routes to the Port of Batangas City in mainland Luzon. Motorized tricycles are a common mode of transport and jeepneys and vans served as transportation options to other municipalities within Oriental Mindoro which passes through the mostly concreted pronvincial road spanning the province. The city also has an airport, the Calapan Airport, classified as a secondary airport and is used for general aviation handling mostly small planes and choppers with regular trips from Manila Domestic Airport. The city is host to numerous higher educational institutions. The Divine Word College of Calapan, a Catholic college run by the Divine Word Missionaries is currently the largest institution of higher learning in the city and the province of Oriental Mindoro. Other private institutions of higher learning include the St. Anthony College Calapan City (Information Technology, Nursing and Tourism), Luna Goco Colleges (Nursing), Southwestern Luzon Maritime Institute Foundation and Filipino Academy of Scientific Trades (Maritime Studies), AMA Computer Learning Center (Information Technology), and CLCC Institute of Computer Arts and Technology (Information Technology). There are currently two public institutions of higher learning in the city. One is the Mindoro State University (Calapan Campus) while the other is the City College of Calapan which was opened last June 2008 through the initiative of City Mayor Salvador Leachon. Calapan has nine national high schools (NHS), one of which is the Oriental Mindoro National High School (OMNHS) the main campus of the school and the largest public high school in Oriental Mindoro. Other public high schools include the Mamerta Gargullo Tolentino Memorial National High School (former Parang NHS), Ceriaco A. Abes Memorial MNHS, Canubing NHS, Managpi NHS, Pedro V. Panaligan MNHS, the Community Vocational High School, the LEMNAHIS Bucayao Annex and the Nag-iba National High School(former LEMNAHIS Annex Nag-iba). The Catholic Church also runs the Holy Infant Academy, while DWCC also maintains a Basic Education Department. Public elementary schools meanwhile are organized into three districts. They are the Calapan West, Calapan South(Pedro Tolentino Memorial School(PTMS) and Calapan East Districts. The city is served primarily by the Oriental Mindoro Medical Center which is also the largest hospital in the province. There are also numerous private hospitals in the city such as the Medical Mission Group Hospital and Health Services Cooperative which is the only tertiary level hospital in the region, Maria Estrella General Hospital, Sta. Maria Village Hospital, Hospital of the Holy Cross and the Luna-Goco Medical Center. In addition, the city has well-equipped public health centers providing free health check-ups and basic medicine supplies to all residents. These public centers are being funded and supported by the City Health and Sanitation Department. Col. Pedro A. Serran (USAFFE-AFP)-- Son of Isidro and Maxima Serran, born November 26, 1913 in Calapan. Known as the "Liberator of Zarraga," Iloilo Province during World War II. He died on June 8, 1999, in Colorado, U.S.A., and is buried in Pittsburgh, California. His life-size statue stands on the park named after him in Zarraga. It was inaugurated in 1998. ^ "Province: Oriental Mindoro". PSGC Interactive. Quezon City, Philippines: Philippine Statistics Authority. Retrieved 12 November 2016. ^ a b c Census of Population (2015). 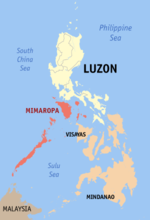 "Region IV-B (Mimaropa)". Total Population by Province, City, Municipality and Barangay. PSA. Retrieved 20 June 2016. ^ "Calapan, Oriental Mindoro Climatological Normal Values". Philippine Atmospheric, Geophysical and Astronomical Services Administration. Archived from the original on 8 October 2018. Retrieved 8 October 2018. ^ "Calapan, Oriental Mindoro Climatological Extremes". Philippine Atmospheric, Geophysical and Astronomical Services Administration. Archived from the original on 8 October 2018. Retrieved 8 October 2018. ^ a b c "About the City - History". Calapan City Government. Archived from the original on February 18, 2009. Retrieved 2009-05-17. ^ Census of Population and Housing (2010). "Region IV-B (Mimaropa)". Total Population by Province, City, Municipality and Barangay. NSO. Retrieved 29 June 2016. ^ Censuses of Population (1903–2007). "Region IV-B (Mimaropa)". Table 1. Population Enumerated in Various Censuses by Province/Highly Urbanized City: 1903 to 2007. NSO. 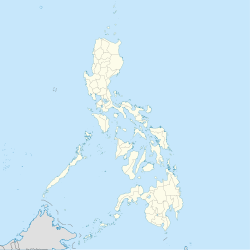 ^ "Province of Oriental Mindoro". Municipality Population Data. Local Water Utilities Administration Research Division. Retrieved 17 December 2016. ^ "Aksyon Agad Programs-Edukasyon" (in Filipino). City Information Office. September 27, 2008. Archived from the original on February 17, 2009. Retrieved 2009-05-17. Wikivoyage has a travel guide for Calapan. Wikimedia Commons has media related to Calapan City.